MIAMI, FL - March 12: Festival-goers have a good time at the 40th Calle Ocho Festival in Miami on March 12, 2017 | PHOTO CREDIT: Raul Diego for deepcitychronicles ©2017 Deep City Chronicles. All Rights Reserved. MIAMI, FL - March 12: Festival-goers enjoy fresh coconuts at the 40th Calle Ocho Festival in Miami on March 12, 2017 | PHOTO CREDIT: Raul Diego for deepcitychronicles ©2017 Deep City Chronicles. All Rights Reserved. MIAMI, FL - March 12: A vagrant stands next to his eclectic trash and toy collection at the 40th Calle Ocho Festival in Miami on March 12, 2017 | PHOTO CREDIT: Raul Diego for deepcitychronicles ©2017 Deep City Chronicles. All Rights Reserved. MIAMI, FL - March 12: A woman rolls cigars at the Guantanamera Café kiosk at the 40th Calle Ocho Festival in Miami on March 12, 2017 | PHOTO CREDIT: Raul Diego for deepcitychronicles ©2017 Deep City Chronicles. All Rights Reserved. MIAMI, FL - March 12: People dance on the streets at the 40th Calle Ocho Festival in Miami on March 12, 2017 | PHOTO CREDIT: Raul Diego for deepcitychronicles ©2017 Deep City Chronicles. All Rights Reserved. MIAMI, FL - March 12: Festival-goers enjoy tacos from a food truck at the 40th Calle Ocho Festival in Miami on March 12, 2017 | PHOTO CREDIT: Raul Diego for deepcitychronicles ©2017 Deep City Chronicles. All Rights Reserved. 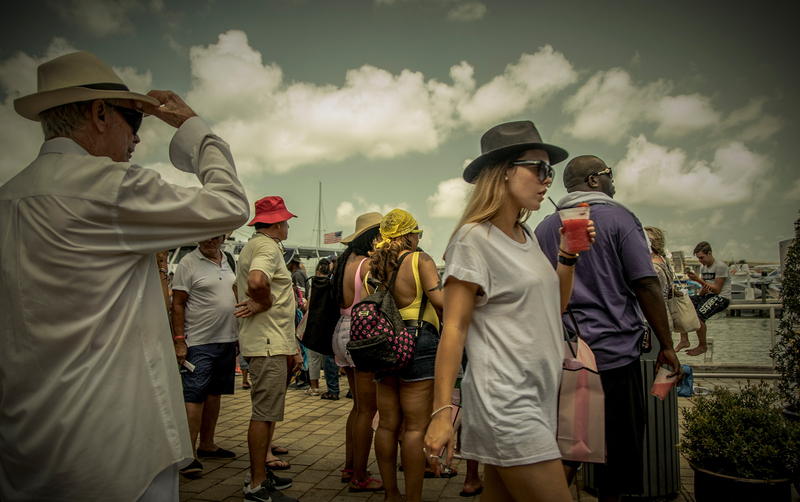 MIAMI, FL - March 12: Festival-goers shop for nation-branded hats at the 40th Calle Ocho Festival in Miami on March 12, 2017 | PHOTO CREDIT: Raul Diego for deepcitychronicles ©2017 Deep City Chronicles. All Rights Reserved. MIAMI, FL - March 12: A group of festival-goers draped in the flag of the Dominican Republic at the 40th Calle Ocho Festival in Miami on March 12, 2017 | PHOTO CREDIT: Raul Diego for deepcitychronicles ©2017 Deep City Chronicles. All Rights Reserved. MIAMI, FL - March 12: Man in a sequence hat and his partner dance at the 40th Calle Ocho Festival in Miami on March 12, 2017 | PHOTO CREDIT: Raul Diego for deepcitychronicles ©2017 Deep City Chronicles. All Rights Reserved. Southwest 8th Street in Miami has long been the center of the Cuban diaspora. Little Havana grew on its asphalt banks as waves of immigrants escaping the Castro regime, landed on its shores year after year and decade after decade since the early 1960’s. The first Calle Ocho festival was held in 1977. It was a Cuban festival. Created by Cubans for Cubans to celebrate their success in exile and thumb their noses at the tyrant ninety miles away. As the years passed, it grew bigger and louder as if to make sure the music would be heard on the island. Slowly, other immigrant groups from central and south America began to join in on the festivities as their numbers also began to swell in the city. Coaxed out of their countries as a result of their own political and economic upheavals, Miami began to see a large influx of Nicaraguans, Colombians, Venezuelans, Argentinians, Dominicans and even Mexicans. Soon, the food kiosks at the Calle Ocho festival would begin to serve ‘arepas’, tacos and churrásco in addition to the staples lechón asado, platanitos and congrí. As long as Fidel was watching, it was all well and good. The more, the merrier, the better to show how everybody came together when they were dancing to the music and sharing in the “Aemrican Dream”. But then something happened last year that will likely to transform the meaning of Calle Ocho forever. In 2016, Fidel Castro Died and Donald Trump became president of the United States. Cubans in Miami of a certain generation – the generation that created Calle Ocho – overwhelmingly supported Donald Trump’s candidacy and Obama’s eleventh hour rescinding of the so-called “Wet Foot – Dry Foot” policy, through which Cubans who managed to reach land in America were automatically granted asylum, strengthened the notoriously anti-Obama Trump’s support among Miami’s Cuban community in hopes that he will, at some point, restore the policy and continue the traditionally hard Republican line against the Cuban regime. Donald Trump’s immigration policy, of course, does not sit well with every other immigrant group that has made Miami their new home besides Cubans, which makes this year’s Calle Ocho festival an awkward affair, to say the least. There was a “Trump Shop” kiosk selling all kinds of Trump presidency mementos, souvenirs and, of course, “Make America Great Again” caps. People would stop and take a picture of the odd, double tent store. Some annoyed revelers cursed loudly at it as they moved past. It is clear that the original intent of the festival and its original hosts are about to clash with history as it moves on to a new era without Fidel Castro and a Trump White House. After forty years of moving to the rhythms of Salsa and Rumba, then incorporating the sounds of Norteñas and Bachata, it looks like the Calle Ocho has finally reached its midlife crisis. Will it survive as a stronghold for immigrant resilience or will it die in a fiery crash in its brand-spanking-new, red sports car?